This highly interactive workshop teaches the basics of running a successful, reward-based crowdfunding campaign. The workshop will teach the importance of finding your niche and cultivating an audience before launching a campaign. Participants will learn the most important elements of a crowdfunding campaign: your video, graphics, project description, title, and rewards. 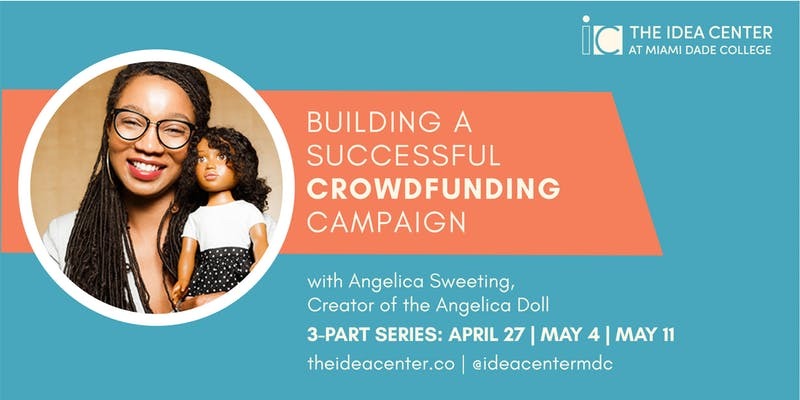 Angelica Sweeting, UM Alumna is the Founder and Creator of The Angelica Doll, a line of 18-inch vinyl dolls with facial features true to women of color and hair you can style/wash as natural hair. To finance the venture, she launched a Kickstarter campaign in May 2015, aiming to raise $25,000. Angelica Sweeting successfully raised $84,743 and received national recognition and support. *Miami Dade College degree-seeking students must be currently enrolled in a for-credit course and must provide a schedule to obtain the discounted price.